Some collaborations come as a surprise, although they are quite obvious. For example, because the participants are harmonizing extremely well musically or publishing on the same label. In the case of Rhys Fulber and Blush Response both comes together – a fortunate circumstance that results in the EP Corruption Of Form which is going to be released on April 4 on Sonic Groove, the label of star DJ Adam X.
Where’s the journey going for Apoptygma Berzerk? Not an easy question to answer. The big and small course corrections in the band’s history supersede speculations about the prospective orientation of the Norwegians around Stephan Groth. Anyway: the last regular studio album turns ten. Much has happened since Rocket Science – in Groth’s life, in the scene as well as in the music world as a whole. Some bands are playing live only because they want or have to promote an album, others do it without a specific reason and without significant lead times. The organizers of Herzschlag, mostly Italians who live in Berlin, are basically only inviting acts and DJs to their events which they themselves are passionate about. Macht kaputt, was euch kaputt macht. Destroy what destroys you. With that song Ton Steine Scherben, one of the most influential German rock bands of the Seventies, once expressed the feelings of an angry, loud and politicized youth. About 30 years later, at the turn of the Millennium, when Ladytron began their career, not only the world had changed, but also the music. Ladytron's comparatively smooth-sounding electronic pop is certainly not a call to revolt, though the name of one of their best-known songs, Destroy Everything You Touch, could definitely be interpreted that way. Progress Productions proudly presents a new artist to its rooster: TUKT! A Swedish duo with members Roy Fröderos and Cas, both with several years of music skills behind them, clearly to be heard in their work. Together they create a murderous, hard and extremely dynamic way of EBM music comprising melodic parts as well as elements from Industrial and a slight spirit of Heavy Metal. Hante.’s music is a paragon of melancholy and cool heaviness. Some call it Dark Wave or Synth Wave. 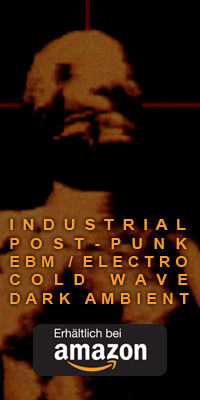 Others prefer the even older name Cold Wave, which originates in the periphery of the French label New Rose Records. Hélène de Thoury was not yet born when the label began its work, but since 2013, the Parisian has produced melancholic, mostly minimal electronic music with a brilliance that far outshines that of many of her predecessors of the early 1980s.